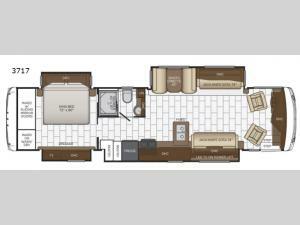 After you set up camp then come indoors and enjoy all of the comforts that this quad slide out Ventana LE 3717 class A motor home has to offer! From the two jack knife sofas to the booth dinette there is plenty of seating/sleeping room in the front of this model. In the kitchen you will find two pantries for all of your dry/canned goods. Come get a good night's rest on the king bed and with two TVs you can choose to watch TV in the living room or the bedroom!